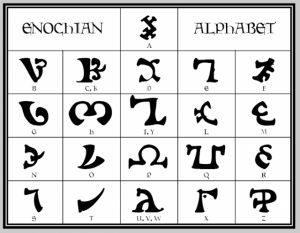 Regarding the letters themselves, Dee notes in a conversation with the angel (28th April 1583): Dee: And first I think that those letters of our Adamical alphabet have a due peculiar unchangeable proportion of their forms, and likewise that their order is also mystical. These letters represent the creation of man, and therefore they must be in proportion. They represent the workmanship wherewithal the soul of man was made like unto his creator.